Buffalo Bill's Wild West Show did come to Sunbury in 1911 and probably by rail as shown in the picture above. It was reenacted under Suzanne Allen’s leadership in 2003 for the Ohio Bicentennial and in 2008 for the Delaware County Bicentennial and on June 25th for the Sunbury Bicentennial Celebration. Little historic documentation is found of the early event. When watching an old film of Buffalo Bill on TV, my father told us he remembered when the show came to Sunbury. A little boy at the time, Bill Whitney watched the tents go up on the field at the corner of Cherry and Morning Street. He watched the parade go into town and around the square. Finally the time arrived for the show. Bill had his coin to get into the big side show tent but his friend did not and convinced Bill to crawl under the tent. The boys were on their hands and knees, heads under the tent when they felt a man grab them by their belts and pull them back out of the tent. Bill was not even allowed to pay and go into the tent. The boys spent the show time sitting before the manager. Stored in Community Library is a Hopkins House Guest Book with a signature for Wild Bill between September 12 and October 11, 1911. The name heads a page with many others from out of town. Were they actors for the Wild West Show? Wild Bill Hickok, killed in 1876, would not have been traveling with the Wild West Show at that time so it may have been an actor's signature. Buffalo Bill Cody may have been there - he died in 1917. It will not matter Saturday June 25 when you revisit the events at J. R. Smith Park. Buffalo Bill's Wild West Show like other traveling events came into town on the railroad. Their cars were removed to the siding near the Great Midwest Yacht Company at 140 East Granville Street, where they would remain until the show moved on. Granville Street had not been dug out to ease the grade under the railroad so there was only a gentle slope from the siding to the main street. The wagons and horses were unloaded and took the tents, scenery, and other parts of the traveling show to the field where the morning was spent setting up the show. A Grand Parade through town, around the square and ending in the field, gave everyone a preview of the show. 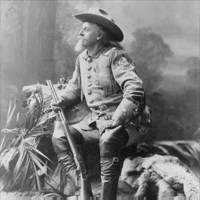 Buffalo Bill Cody was a showman and hired hundreds to portray the glorified history of the west. Under Suzanne Allen's leadership, the 2016 version will have scores of volunteer actors and actress presenting the feel of the early shows. You'll see all your favorites including many renown characters of the West: Buffalo Bill, Chief Sitting Bull, Annie Oakley, Grand Duke Alexis of Russia, Calamity Jane, Pony Express Riders, General Custer, Wild Bill Hickok, Buffalo Gals, Wild Bill Moose, Indians and Pioneers. "I tried to think like Buffalo Bill and make the entertainment for the entire family," commented Allen as she told about the Wild West Incidents such as Cowboy Roundup, Pony Express, Battle of Little Big Horn and Feature Piled on Feature. There will also be a booth with Sunbury Bicentennial information, tee shirts and memorabilia for sale. Parade begins at 4 p.m. Sunday, June 25. The Wild West Show begins at 5:30. Like Buffalo Bill's Wild West Show, the evening is meant to entertain and not necessarily be an accurate account of history. Bring your family and enjoy! 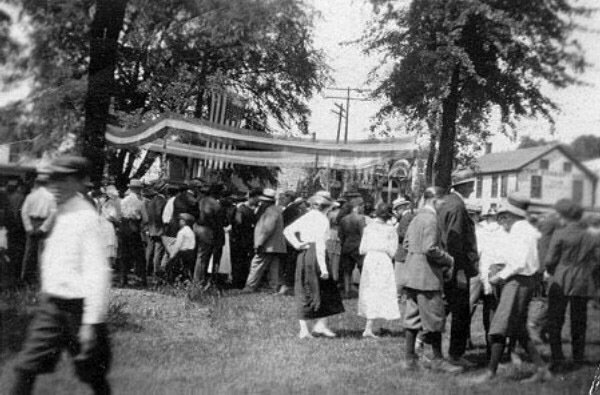 And, if you know more about the Sunbury July 4th Celebration shown in Flo Fairchild's picture above let Polly Horn know.